I’ve been reading a lot lately about worldwide military conflict. As the United States entered its 16th year of the War in Afghanistan, I’ve been thinking more about the U.S. military-industrial complex. Why does the American state spend so much on defense? Or propaganda? American politicians-Republican and Democrat-say we never have enough money to fund those pie in the sky social programs, but have enough to pass a $700B military budget with even the most progressive Democrats voting yes (except Gillibrand, Leahy, Merkley, and Wyden). Why do we spend so much on “defense”? It pays. Aram Roston uncovered Erik Prince’s slides behind his presentation to privatize the Afghanistan War. Prince’s intentions were hardly subtle. An estimated one trillion dollars’ worth of minerals lies in one province alone. War for defense or resources? So with the amount of money going into and out of the Pentagon, I thought I’d look into defense contracting. Here’s what I found based off the top 100 defense contractors list on Defense News. Some of the results may surprise you. Of the top 100 defense contractors for the U.S. Department of Defense (DoD), 58 are foreign-held companies. In descending order, the countries with the most contractors are UK (10), Japan (8), Russia (6), France (5), Israel (4). This doesn’t really amount to much. It’s just funny that Russia ostensibly thwarted the 2016 U.S. election and yet is a major supplier of war products. Of the 42 American defense contractors, 3 are on the Fortune 100, 18 are on the Fortune 500, and 25 are on the Fortune 1000. The most odious thing about this set up is that defense contractors are in the Fortune anything. They are not about peace or stability. Were they about such things, they would put themselves out of a job, and a lucrative one at that. It is not your freedom they fight for; it is their finance. 33 Companies had >50% of their revenues from the DoD; 23 companies had >80%; astoundingly, 10 companies had 100% of their funding from the DoD. 14 of the defense contractors had total DoD revenue over $5B; 7 were over $10B, and the highest (Lockheed Martin) had DoD revenue at $43.47B. Lockheed Martin receives 92% of its funding from the DoD and is currently #73 on the Forbes 500. One of the consistent arguments of socialists and communists is a withdrawal of the state from war. Why? War profiteering is a big motive in starting conflict on the flimsiest of justifications. It inflicts undue suffering on normal citizens to “get back” at or put another state “in its place” (according to the interests of the aggressor). Defensive wars for just reasons make sense. 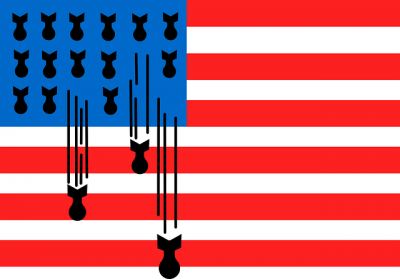 Just how often America and other capitalist nations conduct such wars is another issue. While that issue is easily answered, I will conclude with a question: how often do the U.S. DoD and war departments of the capitalist nations actually conduct defensive wars?